I’ve been coming to Dr. Nelson for years he’s very genuine doesn’t oversell or have a pushy approach. Dr Nelson is great! Very patient understanding and has a natural artistic ability to make you look and feel younger with his treatment options. From plastic surgeries, laser treatments, injections and fillers. He is awesome and you won’t be disappointed!! I have had all of the above and very happy with the results and under his continued treatment for cosmetic maintenance. I highly recommend Dr Nelson to anyone who is exploring plastic surgery or any of the cosmetic treatment options available. He will not disappoint!! I have been a patient of Dr Nelson for over two years. 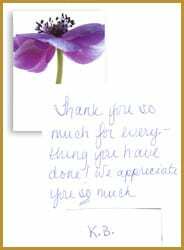 It is difficult to put in words my gratitude for his work, results, bedside manner and follow through – I have had both surgery and cosmetic procedures and every time have had professional customized care. I am very appreciative. 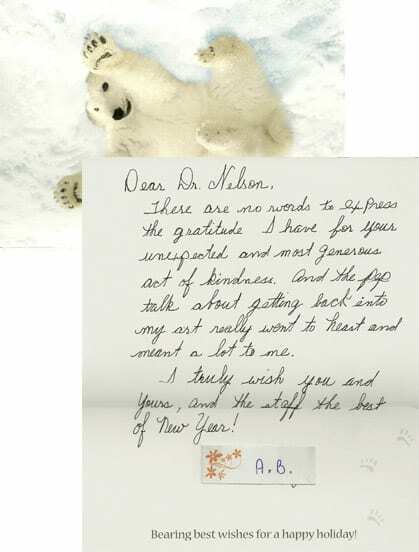 Thank you Dr. Nelson and your wonderful staff. When I turned 70 I finally got the nerve to have cosmetic surgery. My wish list was to have my sagging face and sagging breasts lifted. I interviewed 3 other plastic surgeons. 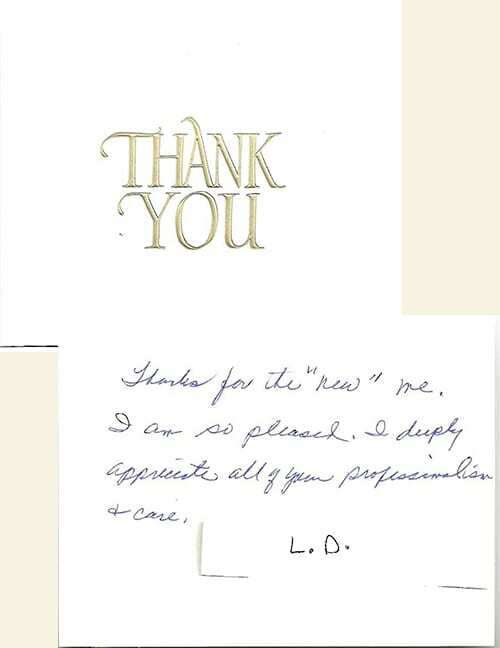 Dr Nelson put me at ease…his fees were the most competitive and my results were better than I expected. Now I’m ready to have the Bra Roll and Handles go away from my sagging back. I cannot say enough positive things about Dr. Nelson and the surgery center. This is my review of my eye lid surgery I received from Dr. Jeffrey M. Nelson. I am very pleased with the results of my eye lid surgery that I had on January 15, 2015. 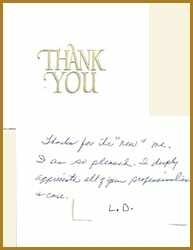 Dr. Nelson and his staff are very professional, kind and courteous. On December 2014 I went in for a free consultation with Dr. Nelson and he took his time with me and listen to what I was wanting and he made suggestions as to what he thought would be the best plan of action for me. Dr Nelson explained the procedures and the staff worked up what the cost would be and let me think about it and decide. The surgery was very affordable. Once I decided they worked with me with the payment, the forms to fill out and gave me pages of instructions to read. Any questions I had all I had to do was call them. On the day of my surgery I was nervous, but the Doctor and staff put me at ease. Dr Nelson talked to me and let me know what he was doing thru the whole surgery. Even after the surgery and with the swelling and bandaging I could tell I liked the result. My eye lids just kept looking better and better each day and within a week I got the bandages off. My eyes looked fanatics and more open. Now it is now about three months later and my eyes are beautiful, I can see the color of my eyes and I have eye lids and not the sagging skin. I am getting so many complements and loving every time people notice. I have also been receiving truSculpt on my neck, which is radio frequency that heats up and burns off the fat and tighten the skin. I am to receive a total of three procedures. I have received two already and I do notice the difference in my neck. Doctor Nelson is very good at what he does. I would and do recommend him and his staff. Give him a try it does not hurt to go in for free consultation. After only two weeks out from you Necklift and blepharoplasty, I was pleased with what I saw in the Mirror-despite lingering bruising, sutures that had not as yet been removed, and some remaining swelling and tautness. Still, I could see the promise of what was to be. During the next two months from the date of surgery, my face literally changed almost daily with the contours becoming more and more flattering. Thank you so much listening so carefully to my concerns and then applying your knowledge and skill to painstakingly interpret those goals to the “canvas” of my face. I believe the subtle improvements you made and the years you erased from my face are almost as much a result of your artistic eye and talent as of your extensive training and experience. You gave me a realistic assessment of what I could expect regarding the procedure, the recovery, and the results. Best of all, you were correct in your assessment. 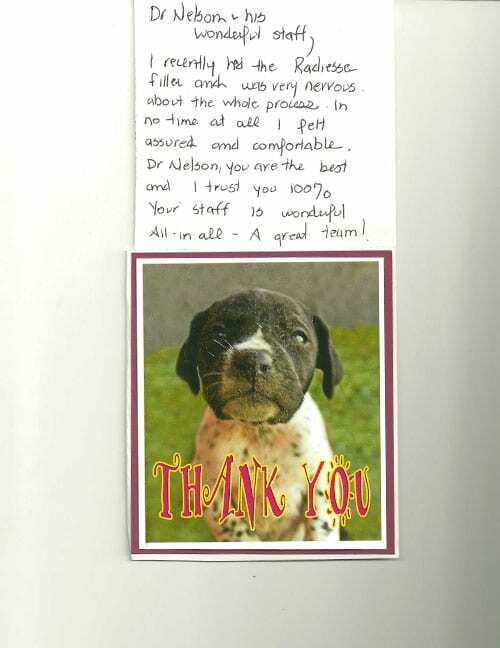 You and your staff made me feel comfortable before, during, and after my procedures and for that I thank all of you. Now that you have fully discharged me from your care, I have to confess that I’m going to miss seeing you. You have a great sense of humor! Thank you so much for everything you have done! We appreciate you so much. 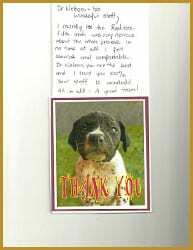 There are no words to express the gratitude I have for your unexpected and most generous act of Kindness. And the pep talk about getting back into my art really went to heart and mean a lot to me. I truly wish you and yours, and the staff the best of New Year! Thank you for everything you have done for me! It means so much to me. You all were wonderful! From the first surgery you preformed on me in 2008 to the most recent in 2014 your skill, expertise, and compassionate care has transformed my life! 🙂 You are an amazing doctor and a true gift to all of the people you have helped. Dr. Nelson and his wonderful staff, I recently had the Radiesse filler and was very nervous about the whole process. In no time at all I felt assured and comfortable. 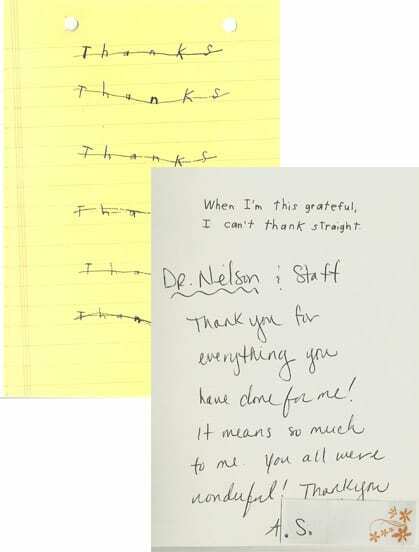 Dr. Nelson, you are the best and I trust you 100%. Your staff is wonderful. All-in-all – A great team! L.F. Thanks for the “new” me. I am so pleased. I deeply appreciate all of your professionalism and care. L.D. Thank you for the wonderful job you did. I’m extremely happy with the results. Also I really appreciate your going the extra mile and fixing the ends of my abdominal scar. Thank you for your professionalism. You all made this a nice experience. 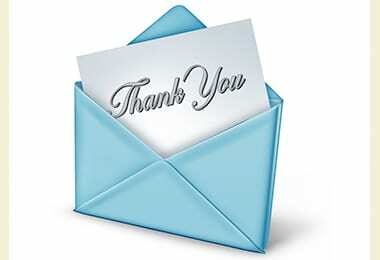 Thank each of you for your support, encouragement and wonderful care during my journey. It’s difficult to be a patient person during recovery. but, each of you have assured me and placed me in a comfort zone, which I truly appreciate. I know my care is in the best of hands and I look forward to referring many of my lovely senior friend to you. I absolutely love Dr. Nelson. He was kind and very informative. Jessica you are the best and Kerri Rage is very sweet and professional. I LOVE Dr. Nelson and his staff. Can’t say enough how much I appreciate everything. Dr. Nelson did a fantastic job! I would highly recommend him. I have the utmost confidence in the office of Dr. Jeffrey Nelson. I experienced very little discomfort after my face lift and my aftercare was superb. Dr. Nelson and his staff did all they could to make me comfortable during my post-op period, from his front office staff to Dr. Nelson himself. I feel young again and I am so pleased every time I look in the mirror. I can’t thank them enough for such an uplifting experience. I would not hesitate to refer anyone to Dr. Nelson. 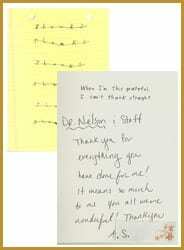 I love the natural results and appreciated the meticulous work Dr. Nelson did. I am so pleased! Dr. Nelson is so awesome! I look and feel so Natural! I had a lower and upper blepharoplasty, Dr. Nelson was so kind, informative, professional for my procedure, and his staff was so sweet & professional. It was a nice experience, this was my first surgery and I hope to see all again. Dr. Nelson is my life saver. After many years on Prednisone due to a medical condition, my body changed drastically. It was affecting every aspect of my life and I knew that plastic surgery was my only solution. Dr. Nelson was highly recommended by two of my doctors. At my first consultation, I was immediately put to ease by Dr. Nelson and his wonderful staff. To date, I have had a facelift, back/flank liposuction and a tummy tuck. I love the natural results. Dr. Nelson is clearly an artist and perfectionist. I would highly recommend this wonderful doctor to anyone considering plastic surgery. 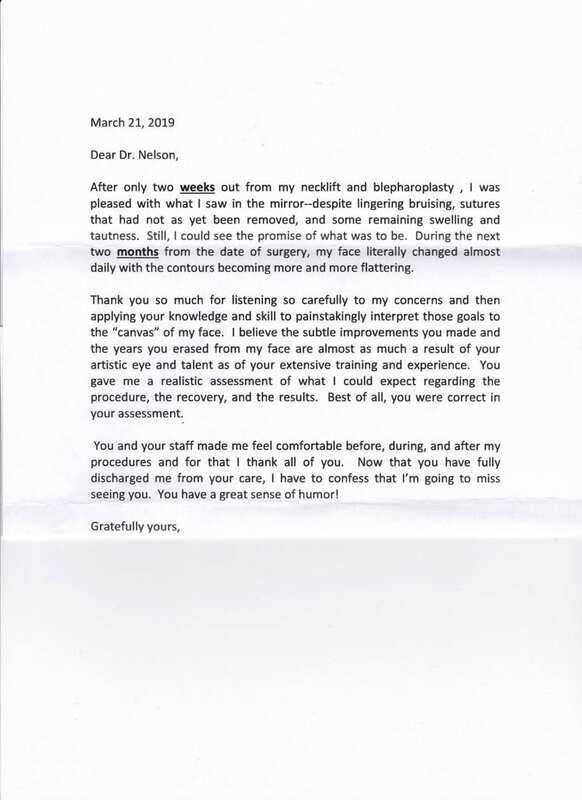 Thank you Dr. Nelson. 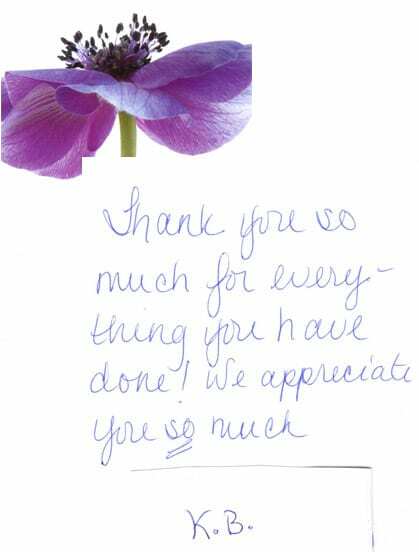 I was a patient of Dr. Nelson’s for breast reconstruction last April. I was under his care since my mastectomy May, 2012. So I saw him regularly for several months. He made me very comfortable and at ease during the process of reconstruction. He was very professional, kind and compassionate. I didn’t feel uncomfortable or scared during my treatments. I will recommend him to my friends and patients if they need a plastic surgeon. His office staff are wonderful and friendly. I always felt welcomed coming to the office. Darcy was always comforting. She was cheerful every time I came which made me forget that I had breast cancer. 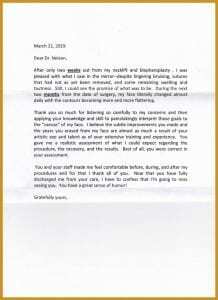 In summary, Dr. Nelson and his staff are great and I would like to commend their wonderful work. I’m doing great and I am going to Italy in September. It is my present to myself for overcoming this hurdle and without Dr. Nelson and his staff, I would not have felt great as I am now. Thank you very much for your great work. I am a healthy gal in my 50’s & I’ve had 2 kids. I eat correctly & love to exercise. Even though I was doing everything to keep my weight in check, I found it a battle to lose that last 10-15 pounds. I went to Dr. Nelson & he performed liposuction/body sculpting. I am absolutely thrilled with my results! Now it’s easy to exercise, eat correctly & have a wonderful figure! My husband loves my new body! 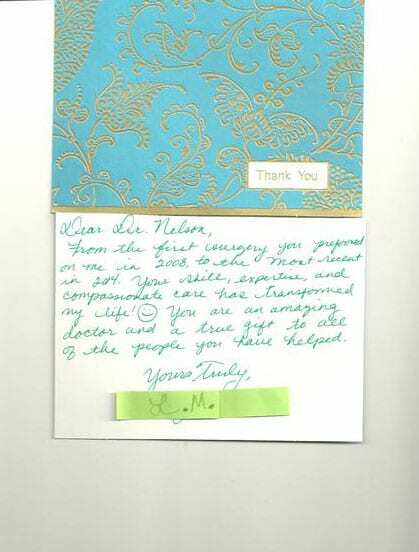 Dr. Nelson is an excellent surgeon, I felt safe in his hands & his staff is informed & helpful. I would highly recommend Dr. Nelson to anyone looking to improve their quality of life.